China customs has announced it will expand its rapid clearance “three once” regime nationwide to promote trans-regional trade. 56 Chinese border inspection stations will adopt this policy of customs clearance this year involving a single declaration, according to General Administration of Customs spokesman Zhang Guangzhi. The ‘three once’ system launched jointly by customs, inspection and quarantine authorities means once only declaration, once only inspection and once only clearance. It was first started at Guangzhou’s Nansha port in May 2012, then the scope of the pilot reform in 2013 expanded to eight provinces and cities including Tianjin, Shanghai, Heilongjiang, Jilin, Liaoning, Inner Mongolia and Fujian. 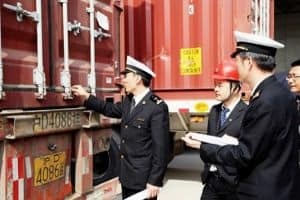 Every container whether imported or exported will now be opened and checked only once, reducing the manpower, time and cost for related customs authorities. Shippers will no longer have to run around customs and inspection units for shipment clearance. According to statistics from General Administration of Customs, under the ‘three once’ system, enterprises have saved customs clearance costs of more than CNY4 million in Guangdong in 2013. Some companies have said that the new ‘three once’ customs clearance policy has enhanced declaration efficiency by 25 per cent and reduced inspection time and cost by nearly half. Reference: Shipping Gazette – Daily Shipping News, 56 Chinese border posts adopt ‘only once 3 in 1’ inspection regime, 2014. Article, China to expand –three once’ customs regime nationwide in 2014.